Copyright: © 2017 Wang H, et al. This is an open access article distributed under the Creative Commons Attribution License, which permits unrestricted use, distribution, and reproduction in any medium, provided the original work is properly cited. Interferons are multifunctional cytokines widely used in clinical settings as an anti-viral drug. In addition, interferon’s exhibit anti-cancer and anti-bacterial effects. Nearly two thousand papers related to interferon are published each year, which illustrates the importance placed by researchers on the study of interferon. This review focuses on recent advances in the study of interferon, particularly in the areas of its mechanism of anti-cancer effect and signal transduction. We also describe the tumor resistance to interferon and the side-effect of interferon-based therapy, which leads to an expectation of future research of interferon. Interferons (IFN) are anti-viral cytokines that has been widely used clinically, especially against Hepatitis B virus (HBV) and Hepatitis C virus (HCV). The discovery of interferon is comparable to that of antibiotics, and may in fact be even more important given the fact that bacteria can be removed by filtering whereas viruses cannot. Interferon attracted worldwide attention after its discovery by Isaacs and Lindenmann in 1957, but initially researchers were only able to verify its existence and function and were unable to obtain enough amounts for further research and clinical applications. In 1986, 29 years after the discovery of interferon, the development of genetic engineering enabled the production of large quantities of high-quality interferon. This allowed for its wide spread application in both research and clinical settings, which ushered in a new era for interferon. Milestones in interferon research up to the year 2000 are summarized in table 1 . Table 1: Milestones of interferon research before 2000. Since 2000, a major breakthrough in interferon research occurred in 2003 when two labs independently reported the discovery of a third type of interferon, IFN-λ with its three subtypes, IFNλ-1, IFNλ-2 and IFNλ-3  (also known as IL-29, IL-28A, and IL-28B respectively ). These new interferons were later proven to have anti-viral effects, and were thus formally classified as type III interferons. Just seven years later, type III interferons were applied clinically for the first time when type III interferon drugs developed by two companies, BMS and Zymo Genetics, had entered phase three clinical trial. In January 2013, a new type of interferon, IFNL4 , was reported and soon produced a new upsurge in interferon research. Interferons are a family of autocrine and paracrine cytokines secreted by host cells in response to pathogens, especially viruses. Generally, interferons are comprised of 130-170 amino acids with a molecular weight of 20∼100kD and are easily degraded by proteases, diethyl either, chloroform and ketones. Heat stability of interferons varies on their source . The activities of human interferons is generally less stable when heated compared to other species, in most cases, a reduction in activity of these interferons is observed after 1 hour at 56-60°C. However, stability over a wide pH range is quite a characteristic property of interferons [6,7]. The in vivo half-life of type I interferons is generally 5-7 hours and can be greatly extended through PE Gylation. Self-crosslinking is closely related to the stability, activity level, and biological functions of interferons. Researchers have reported that human IFNα-2b can undergo self-crosslinking to form stable dimers and reversible polymers . A control study found that the recombinant fusion protein alb interferon α-2b and PE Gylated human interferon α-2b (PEG-IFNα-2b) are both capable of undergoing self-crosslinking, with the former forming mainly reversible dimers or trimers and the latter forming only reversible dimers. In addition, the study showed that ionic strength and buffer pH are closely related to self-crosslinking. Previously, interferons were classified based on their cell origin. This resulted in three types, α, β, and γ, which originated from virus-infected leucocytes, virus-infected fibroblasts, and activated T-cells, respectively. 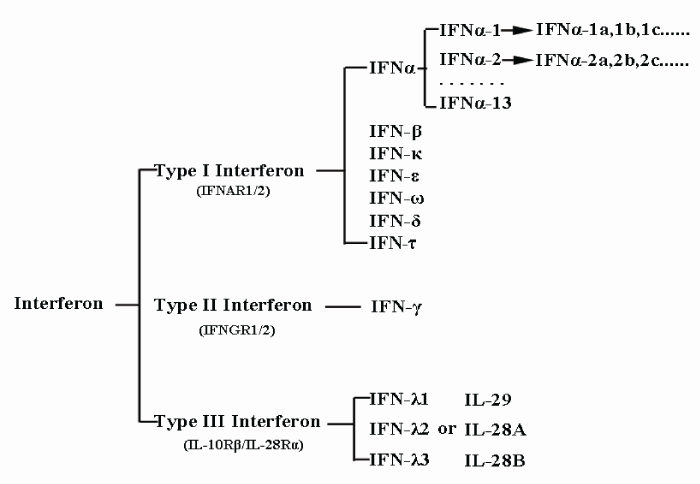 However in 2003, IFN-λ, a new type of interferon that did not fit into any of the three pre-established categories and utilized a distinct receptor was discovered [9,10]. To accommodate this new class of interferon, α, β, γ and the newly-discovered interferon λ were resorted into interferon types I, II, and III in accordance with their receptors. Type I interferon, which comprises α & β interferons of the previous classification system, can be further sorted into 17 different subtypes based on their different antigenicity. These subtypes are indicated by Greek letters and can be further divided into even smaller categories. For example, IFNα contains 13 smaller subtypes, indicated by Arabic numerals (IFNα-1, IFNα-2, IFNα3, etc. ), which in turn are divided into various sub-subtypes, including IFNα-1a, IFNα-1b, IFNα-1c and so on. This current classification system is illustrated by figure 1. Figure 1: Classification of interferons. Based on the type of receptor through which they signal, interferons have been classified into three major types and each of them contains subtypes except Type II interferon. On January 6th, 2013, an article in Nature Genetics reported the discovery of another type of interferon, IFNL4 . The authors found that although the amino acid sequence of IFNL4 contains the binding site for one of the IFN-III receptor subunits IFNLR1 (IL-28Rα), it does not contain the binding site for IL-10R2, another receptor subunit associated with type III IFNs. However, further study proved that IFNL4 activates interferon response and exerts antiviral effects through the canonical type III IFN receptor complex composed of IFNlR1 and IL-10R2 , making IFNL4 a member of type III IFN. Interferon signaling is cell-specific and exhibits wide diversity and complexity . Major interferon-related signaling pathways are summarized below. Classic signal transduction: IFN-induced signaling transduction and transcription activation proceeds through the classic JAK/STAT pathway. Interferon first binds specifically to and activates cell surface receptors; type I interferons such as IFN-α and IFN-β bind to type I receptors (IFNAR1/2), IFN-γ binds to type II receptors (IFNGR1/2) , and IFN-λ binds to type III receptors (IL-10R2, IFNLR1) [2,3]. Classically, these receptors function as heterodimers and neither subunit can transduce the signal individually. After interferon binds to the receptor, Janus kinase (JAK) in the cytoplasm associates with the receptor’s cytoplasmic domain. JAK is a member of the Janus family of tyrosine kinases, which includes JAK1, JAK2, JAK3 and TYK2. STAT (signal transducer and activator of transcription) includes STAT1, STAT2, STAT3, STAT4, STAT5a, STAT5b and STAT6. Of these, JAK1, JAK2 and TYK2 along with STAT1 and STAT2 directly participate in the interferon-induced JAK/STAT signal transduction pathway. Reports have indicated that after IFN binds to cell surface receptors and activates JAK, the activated kinase phosphorylates STAT and causes it to polymerize into a homodimer or heterodimer, namely, interferon-stimulated gene factor (ISGF)-9 or 3 that acts as an activated transcription activation factor. ISGF enters the nucleus and binds to the promoter sequence of interferon stimulated genes (ISGs), resulting in high expression of these genes. This in turn leads to anti-viral, anti-cancer, and immunoregulatory effects (Figure 2) . In addition, IFN receptors exhibit circadian expression; for example, their expression level is higher at night than during the day . Thus, receptiveness to interferon also varies in a circadian manner. Figure 2: Receptor activation signalling pathways by type I, type II or type III interferons. Type I interferons (IFNs) (α, β ω, κ, ε, δ (pigs), τ (ruminants)) interact with IFN (α, β and ω) receptor 1 (IFNAR1) and IFNAR2; type II IFN-γ with IFN-γ receptor 1 (IFNGR1) and IFNGR2; and type III IFN-λs with IFN-λ receptor 1 (IFNLR1; also known as IL28RA) and interleukin 10 receptor 2 (IL10R2; also known as IL10RB). Type II IFN-γ is an antiparallel homodimer exhibiting a two-fold axis of symmetry. It binds two IFNGR1 receptor chains, assembling a complex that is stabilized by two IFNGR2 chains. 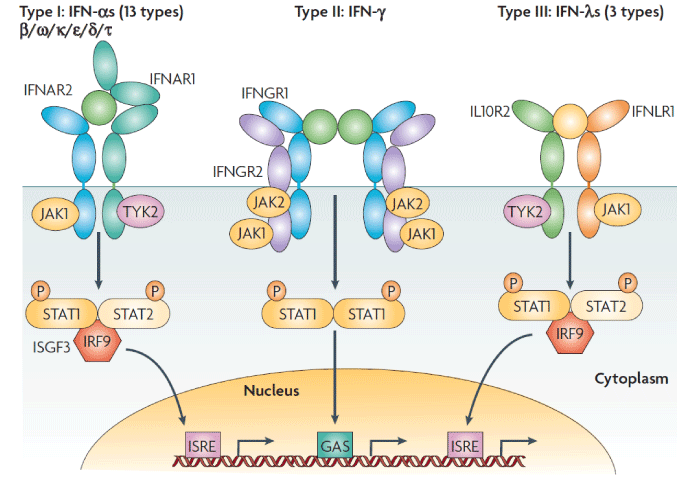 These receptors are associated with two kinases from the JAK family: JAK1 and TYK2 for type I and III IFNs; JAK1 and JAK2 for type II IFN. All IFN receptor chains belong to the class 2 helical cytokine receptor family, which is defined by the structure of the extracellular domains of their members: approximately 200 amino acids structured in two subdomains of 100 amino acids (fibronectin type III modules), themselves structured by seven β‑strands arranged in a β‑sandwich. The 200 amino-acids domain usually contain the ligand binding site. IFNAR2, IFNLR1, IL10R2, IFNGR1 and IFNGR2 are classical representatives of this family, while IFNAR1 is atypical as its extracellular domain is duplicated. GAS, IFN-γ-activated site; IRF9, IFN regulatory factor 9; ISGF3, IFN-stimulated gene factor 3, refers to the STAT1–STAT2–IRF9 complex; ISRE, IFN-stimulated response element; P, phosphate; STAT1/2, signal transducers and activators of transcription 1/2. Non-classic signal transduction: Apart from the JAK/STAT pathway, interferon can also utilize other signaling pathways. For example, it can activate the PI3K-AKT-NF-ΚB and ERK-AP-1 pathways, which can operate in conjunction with the JAK/STAT pathway to transmit interferon-induced signals. The specific pathways utilized are dependent not only on cell type, but also on the type of interferon . Recent reports have also indicated that some kinds of adapter proteins, such as Gab2, compete with IFNAR2 to bind IFNAR1, thus influencing the transmission of interferon-induced signals . It was generally deemed that type I interferons usually exerted their function via the heterodimeric IFN receptor complex, while by the year of 2013, a research revealed that IFN-β could uniquely bind to IFNAR1 in an IFNAR2-independent manner, inducing a distinct set of interferon-inducible genes in an LPS treated mouse model [16,17]. Additionally, recent research found that interferon signaling can work like steroid signaling as IFNAR1 and IFNAR2 along with TYK2 and STAT1 can form a complex that binds to the promoter of the OAS1 gene in cells treated with IFNα2 . Similarly, IFNγ can bind to the extracellular domain of IFNGR1 and enter the cytoplasm together through endocytosis and finally translocate into the nucleus. However, IFNGR2 doesn’t take part in this process [19,20]. Interferon and microRNA: reports have indicated that IFN-β can regulate the expression of eight kinds of microRNA that target genes influencing the replication of HCV, leading to down regulation of these genes and thus inducing an anti-viral effect . Another study showed that liver cancer patients with low levels of miR-26a expression exhibited a better response to treatment with IFNα . In addition, microRNA microarray analysis of liver cancer and melanoma cells treated with IFNα-2a indicated that many interferon-regulated microRNAs participate in the inhibition of transcription of genes related to cytokine activity . Other recent reports showed that IFN-β inhibits fibrosis of the liver independent of its anti-viral effects and that this anti-fibrosis effect is achieved through the down regulation of cyclin E1 expression by miRNA-195, which inhibits the proliferation of hepatic stellate cells . A. SOCS (suppressor of cytokine signaling) family proteins, such as SOCS1 and SOCS3, can directly bind to and inhibit the activity of JAK as well as facilitate the degradation of the interferon receptor complex [26-28]. B. SH2 domain-containing tyrosine kinases, such as SHP1 and SHP2 , can dephosphorylate and thus deactivate STAT, which in turn prevents it from entering the nucleus and regulating transcription. Additionally, inhibition of SHP2 can significantly increase the anti-tumor effects of IFNα-2b . C. PIAS (protein inhibitor of activated STAT) family proteins can inhibit the binding of activated STATs with their target DNA sequences or cause simulation of STATs that have already entered the nucleus, thus altering gene transcription and influencing interferon-induced signaling. Recently, a peculiar class of protein-DNA complexes was discovered. It includes such complexes as RNA binding protein-DNA complexes, mitochondrial protein-DNA complexes, and kinase-DNA complexes. Among them, the ERK2-DNA complex can significantly inhibit the expression of IFN-γ-induced genes, thereby inhibiting interferon-induced signaling . Bcr-abl can activate PKD2, which promotes the phosphorylation and degradation of IFNAR1, thereby reducing the therapeutic effects of IFN-α in chronic myelogenous leukemia . Other reports indicate that tumor inflammatory factors like IL-1 and activated p38 because tumor cells to become resistant to interferon therapy . Although the anti-viral function of interferon has been documented extensively, interferons have also shown anti-cancer effects mostly through application as a non-therapeutic auxiliary second-line drug. In large enough doses, it can also be applied as a first-line cancer drug, but the level of purity required for such doses is difficult to obtain. The main anti-cancer effects of interferon include suppression of cell growth, promotion of cell death and senescence, inhibition of cell migration, prevention of angiogenesis, and immune regulation. Each of these effects is described in more details below. The prominent characteristic of tumor cells is their uncontrolled division, which overrides the checkpoints that normally keep cell division in check. Thus, one of the aims of drugs and other non-surgical therapies is to control the development of tumors through suppression of cell growth and division. Research has shown that interferon is able to regulate the expression of different genes involved in the cell cycle, including the oncogenes c-myc , cyclinD3 and CDC25A ; the precise mechanism of cell cycle suppression may depend on the cell type. Also of note is the fact that the anti-cell proliferation effect of interferon is independent of its anti-viral activity and requires the participation of TCR signaling, such as CD45, Lck, and ZAP70 . Furthermore, a reconstructed IFNα2 comprised of H57Y, E58N, and Q61S (YNS) mutations , which can bind IFNAR1 60-fold tighter compared with wild-type IFNα2, exhibits nearly 1000-fold enhancement of anti-proliferative activity while its antiviral activity stay almost unchanged . IFNα can directly inhibit the proliferation of hepatic progenitor cells both in vitro and in vivo . Research has also revealed that the interferon-induced Trans membrane protein 1 (IFITM1) plays an indispensable role in the anti-cell proliferation effects of IFNγ . In addition, interferon regulatory factor 6 (IRF6) promotes cell cycle arrest through a cell-cycle dependent manner and is subject to the regulation of proteasomes . In renal cancer cells, it has been found that IFNα can upregulate expression of the protein NUB1 and significantly inhibit the growth of tumor cells . In IFN-β treated pancreatic cancer cells, STAT3 induced survival signal can be antagonized by the PPAR-gamma agonist troglitazone (TGZ) . Apoptosis: IFN-γ can regulate apoptosis molecules such as caspase 1 and caspase 3 by way of TRAIL death receptors, thus directly mediating cell death in hepatic cancer cells . In the early stages of liver cancer, IFNα-2b can cause apoptosis through the TGF-β signal pathway . Other research has shown that type I interferon can utilize other signaling pathways to incite apoptosis. For example, they regulate the kinase PI3K, mTOR (mammalian target of rapamycin), and other molecules, which in turn induce the mitochondrial pathway of apoptosis and trigger cell death . In addition, IFN-α and 5-Fu can cause apoptosis in hepatic cancer cells through mitochondrial pathways and by influencing intracellular Ca2+ concentration . When taken in conjunction with retinoic acid, IFN-α can induce apoptosis in lymphoma cells through the Act-dependent regulatory pathway . Necroptosis: Current research shows that necroptosis is not a passive, mechanical method of cell death, but rather a form of programmed cell death induced by the RIP1/RIP3/MLKL signaling pathway . Recent studies have also found that the mitochondrial protein phosphatase PAGM5 acts as a signal convergence point for signals associated with programmed necroptosis . Salmonella enterica serovar Typhimuriumcan can induce the production of type I interferon, which in turn activates RIP1/RIP3 through the binding of IFNAR1 to the kinase RIP1 and leads to necroptosis of macrophages . In this way, the bacteria escape the immune response they invoke. Autophagy: IFN-γ induces autophagy in Huh-7 hepatic cancer cells through up regulating interferon regulatory factor IRF1/beclin/atg5 signaling , thus suppressing cell growth and leading to anti-cancer effects. Senescence: According to recent reports, IFN-β can induce senescence in HPV-transformed keratinocytes through up regulating the transcription activation signals of PML, P21 and P53 . This demonstrates that interferon-induced signals play an important role in the induction of cell senescence. When used independently as a medicinal drug, PEG-IFNα-2b inhibits angiogenesis and cellular adhesion, thus effecting direct and significant inhibition of metastasis in MH134 (murine hepatic cancer) cells . Through the STAT1-mediated up regulation of PML and subsequent inhibition of the integrin ITGB1, IFN-α inhibits the migration and blood vessel formation of human umbilical vein endothelial cells (HUVEC) and human micro vascular endothelial cells (HMVEC) . In prostate cancer, low doses of IFN-α increase the anti-growth and anti-migratory effects of the acetylase inhibitor VPA . IFN-α also enhances the anti-growth and anti-metastatic effects of the P-gp substrate DTX in murine Lewis lung carcinoma . IFN-α can down regulate the expression of the vascular endothelium growth factor VEGF through regulating the activity of transcription factors SP1 and SP3, which suppresses the transcription initiation of VEGF promoter. In neuroendocrine tumors, this leads to direct anti-angiogenic effects . Other reports note the potent anti-angiogenic effects observed in immune deficient SCID ovarian cancer mouse models when murine IFN-α is introduced by way of lentiviral vectors . It has also been observed that IFN-β combined with the angiotensin transferase inhibitor Perindopril has an anti-angiogenic effect in hepatic cancer models . Adenovirus-induced IFN-β also exhibits anti-cancer effects through the down regulation of IL-8 and VEGF-A, which inhibits angiogenesis in cancerous prostate tissue in situ . Other research indicates that interferon regulatory factor IRF1 can significantly down regulate the phosphorylation of AKT and eNOS, thus antagonizing the angiogenic effect of VEGF in human epithelial umbilical vein cells . Further, the interferon-induced protein IP10 can significantly inhibit angiogenesis in conditions of localized ischemia, providing a new target for combating tumor angiogenesis . In human lung cancer cell SPC-A1, IFN-β can transduce epithelial progenitor cells and inhibit tumor angiogenesis through by stander effect . Current research also indicates that VEGF can recruit the kinase PKD2, which causes the degradation of the IFNAR1 receptor by ubiquitination, thus antagonizing the interferon receptor signal to in turn achieve the angiogenesis-promoting effects of VEGF . In addition, epithelial progenitor cells (EPCs) that express IFN-β can inhibit tumor angiogenesis in non-small cell lung cancer cells SPC-A1 . (1) Enhance the function of T and B lymphocytes. For example, if IFN-α is added to the supernatant when melanoma cells and peripheral blood cells are incubated together, the proliferation of cytotoxic T lymphocytes (CTL cells) is markedly increased, as is the killing effect these cells have on the melanoma cells  and in addition, the survival of CD4+T cells  and activated CD8+T cells is maintained . (2) Increases the activity of macrophages [69-71]. (3) Enhance the activity of natural killer (NK) cells . Cells treated with interferon produce 2’-5’ triadenosylnucleotide (2’-5’ P3A3) by way of 2’-5’ oligoadenylate syntheses; our lab has shown that 2’-5’ P3A3 in turn increases the killing effect of NK cells . Thus, interferon plays a critical role in the regulation of many factors in the NK cell system, which is the body’s first line of defense against tumors. (4) Regulates humeral immunity. For example, interferon can induce interleukins, tumor necrosis factors, and colony stimulating factors, and can work in concert with them to regulate immune response. Further, interferon can accelerate the production of antibodies and raise antibody titer. This allows immune protection to be achieved earlier and assists in the killing of tumor cells, resulting in an increased anti-cancer effect. (5) Regulates the expression of several hundred different genes (interferon-stimulated genes), commonly known include: a. promoting formation of immune specific cytotoxic T cells and expression of major histocompatibility complex class II and I (MHC-II, MHC-I) molecules by antigen presenting cells (APCs) and killer T cells respectively; b. promoting expression of the adhesion molecule ICAM4 in endothelial cells and the ICAM4 receptor molecule LFA-1 in lymphocytes. The adherence of these two molecules causes inflammatory cells to exude from blood vessels, leading to an immune response; c. strengthening the effects of natural immune cells, for example by activating phagocytosis in mononuclear macrophages; d. stimulating the expression of various chemotactic factors, which regulate tumor inflammation; e. directly stimulating the expression of specific antigens on the membranes of tumor cells, which allows native cells to distinguish them. Recent research has indicated that murine IFN-β administrated by intraperitoneal injection increases the immunogenicity of tumors expressing the WT1 polypeptide, thus increasing the amount of WT1-specific CTL, the activity of NK cells, and the level of MHC-I within the tumor; in turn, this improves the survival rate of tumor-bearing mice . It has also been shown that IFN-β is an essential bridge molecule that links innate immunity as it relates to the control of anti-cancer effects and acquired immunity in humans . Through the effects described above, interferon improves immune defense and strengthens immune-mediated specific and non-specific tumor destruction, which is also an important component of its anti-tumor mechanism. Also of note is the fact that in oral squamous cell carcinoma, IFN-γ induces PD-L1 (a member of the B7 family) through PKD2 pathway, thus inhibiting tumor development . And there is also study indicating type I interferon could induce PD-L1 expression . Besides, IFN-γ allows tumors to acquire STAT1-related epigenomic and transcriptomic changes and augments expression ligands for multiple T cell inhibitory receptors through a PD-L1 independent manner . Clinical results involving the use of interferon as an adjuvant in the treatment of high-risk melanoma demonstrate that it significantly improves disease-free survival (DFS) and overall survival (OS) . In addition, instances of interferon used clinically in conjunction with other anti-cancer therapies, including radiotherapy and chemotherapy, have been frequently reported, and previous reports have indicated that low-dosage IFNα can inhibit activity of regulatory T cells (Treg), while low dosage IL-2 can up regulate expression of TNF-related apoptosis-inducing ligand (TRAIL) in peripheral blood mononuclear cells (PBMCs). Research has shown that these two compounds used in combination can greatly enhance the killing effect of PBMCs on metastatic renal cancer cells . Clinical results demonstrate that Fluorouracil (5-FU) used in conjunction with PEG-IFNα-2b can effectively prevent the progression of disease and increase overall survival among HCC patients . When combined, 5-FU and IFNα increase NKG2D and MHC-I expression, thereby increasing the immunogenicity of pancreatic cancer cells and increasing immune clearance of tumor cells by NK and CD8+T cells . IFNα-2b combined with grape seed proanthocyanidin (GSP) can significantly reduce proliferation of bladder cancer cells . The use of genetically modified viral vectors, such as adenoviruses [84-86] or Adeno-associated virus (AAV) , carrying IFNβ genes has also been reported. Significant anti-cancer effects have been observed using this targeted gene-viro therapy approach. Reports have indicated that when IFNα-2b albumin fusion protein was administrated in high doses, two cases of interstitial lung disease accompanied by heavy coughing were observed, resulting in the eventual death of one of the patients . Many clinical side effects have also been observed in melanoma patients treated with IFNα-2b, including fatigue, myalgia, nausea, vomiting, liver toxicity, reduction of white blood cell count, and efferent nerve stimulation. When used in the treatment of chronic myelogenous leukemia (CML), IFNα has caused acute side effects including anorexia, fever, cold sensitivity, myalgia, and headache . Although these acute side effects are generally temporary, medicinal use of interferon is also associated with various chronic side effects, including fatigue, weight loss, myalgia, depression, cognitive impairment, and various immune-induced complications such as autoimmune hemolytic anemia, collagen vascular disease, and thyroid function decline, and immune-related nephritis. Of these, depression and cognitive impairment are generally dose dependent and are aggravated by the continuation of interferon treatment. Rare instances of congestive heart failure and cardiac dysrhythmia have also been reported, as well as instances of IFNα-2b-induced type I diabetes . These side effects have greatly impacted the further development of interferon-based clinical treatments. Currently, little research regarding the molecular mechanisms behind the side effects of interferon has been carried out. IFNα is proposed to induce autoimmunity through direct tissue toxicity and immune responses ; however, genetic background like single-nucleotide polymorphisms (SNPs) also contributes to IFN induced autoimmunity [92,93]. Recent study has shown that IFNα treatment on human islets and human EndoC-βH1 cells can significantly decrease insulin production by triggering endoplasmic reticulum (ER) stress, which provides possible explanation for the induction of type I diabetes during IFN therapy . Our lab previously reported that the IFNα-2b protein contains two domains that are respectively responsible for controlling anti-viral immunity and opioid drug-like neuroregulatory effects . The physiological function of the latter domain is primarily mediated by the μ opium receptor . We found that if the phenylalanine in the 38th position is mutated to leucine, the anti-viral effect of the resulting 38Leu-IFNα-2b is retained, but the analgesic effect of the drug is lost entirely. In contrast, if the tyrosine in the 129th position is mutated to serine, the anti-viral effect of the resulting 129Ser-IFNα-2b is almost entirely lost, while the analgesic effect is retained. Additionally, studies of mutant 129Ser-IFNα-2b and wild-type IFNα-2b have shown that both types of interferons can reduce the production of cAMP and induce the release of the prostaglandin E2 in the hypothalamus, leading to fever; this effect can be inhibited by the morphine antagonist Naloxone. However, the fact that 38leu-IFNα-2b cannot be similarly inhibited indicates that it is not associated with fever . Thus, 38leu-IFNα-2b is a potential candidate for ameliorating the fever side effect frequently caused by interferon. Current research indicates that for patients suffering from different types of cancers, such as early-stage breast cancer , interferon-induced signals are commonly weakened. Additionally, interferon-associated molecular signals, including the interferon-induced genes STAT1, IFI44, IFIT1, IFIT2, and MX1, are all down regulated in lymphocytes relative to healthy populations; these effects, which are not caused or influenced by chemotherapy, suggest that these cells possess resistance to interferon. From an immunological perspective, weakened interferon-induced signaling results in reduced antitumor response by NK, B, and T cells. And in terms of molecular mechanisms, research has indicated that the expression of such interferon signaling molecules as IFNAR, STAT2, JAK2, and TYK2 in resistant tumors does not differ from that of healthy cells. However, resistant cells have been found to inhibit JAK/STAT cell factor signaling through a negative feedback loop; PIAS also specifically decreases the phosphorylation of STAT1 at the 701 position in these cells . Additionally, tumor-secreted IL-4 , IL-10 , TGF-β , tumor-associated leukocytes, regulatory or inhibitory peripheral blood cells such as Treg  and myeloid-derived suppressor cells (MDSC) can all induce the expression of molecules that inhibit interferon-induced signaling through negative feedback loops . At the same time, high levels of VEGF in the bloodstream of patients with interferon resistant tumors can inhibit the maturation of dendritic cells and promote the proliferation of MDSCs to weaken the receptiveness of tumors to interferon . Research has also revealed that VEGF can activate PKD2 through the VEGR2 receptor; PKD2 then binds to interferon-α/β receptor 1 (IFNAR1), leading to phosphorylation and ubiquitination that results in clearance of the receptor. This results in an anti-interferon effect that is essential to angiogenesis in tumor tissue . Recent research has found that downregulation of the type I interferon receptor chain IFNAR1 in tumor stroma occurs in human and mouse models of colorectal cancers (CRC), which leads to an immune-suppressed niche and promote CRC growth and development . Other reports indicate that in chronic myelogenous leukemia cells, Bcr-Ab1 can weaken the anti-tumor effect of IFN-α through the rapid degradation of interferon receptors . And It has also been demonstrated that Insulin-like Growth Factor 1 (IGF-1) can down regulate the expression of the IFN-γ receptor R2 on the cell membrane of T cells, thus desensitizing IFN-γ/STAT1 signaling . Currently, a number of biotechnology companies are researching innovative ways to produce more effective interferons. For example, IFNα-2b-albumin fusion protein has a greatly extended half-life and can thus be administrated just once every 2-4 weeks while still maintaining its efficacy during a treatment course for HCV . In addition, pre-clinical research results indicate that the PEGylated type III interferon PEG-rIL-29 does not cause adverse circulatory side-effects when used to treat HCV . In another report, four glycosylation sites were added to a specific location on the human recombinant interferon IFNα-2b through point mutation, and researchers found that the half-life of the mutated interferon in rat blood plasma was 25 times longer than wild-type interferon, and its immunogenicity was also significantly decreased. At the same time, its anti-prostate cancer effect was significantly improved compared to human recombinant IFNα-2b and PEGylated human IFNα-2b . Still other studies report that the fusion of interferon and CD20 antibodies exhibits improved therapeutic effects in the treatment of B cell lymphoma . Many of these innovative interferons are currently at all phases of clinical trial; representative interferon products are summarized in (Table 2) . Besides these, our lab along with the Sichuan Huiyang Company have developed a recombinant interferon called super interferon (sIFN-I) that exhibits enhanced anti-viral and anti-cancer effects with low toxicity. Gene expression microarray in lung cancer cells treated with super interferon and regular interferon (IFNα-2b) exhibited vastly different gene expression patterns. Moreover, sIFN-I has a higher affinity for the IFN1 receptor and elicits a higher expression of IFN-inducible genes; treatment with sIFN-I also shows inhibited angiogenesis and increased CD8+T cell infiltration in tumor . Table 2: Innovative interferon’s in clinical trial. Interferon has been utilized as an anti-viral drug for more than 20 years, but it has consistently exhibited limited anti-cancer effects. Because of this, the mechanisms behind are worth further investigation in order to build a better foundation for potential use of emerging innovative interferons to treat cancer in clinical settings. Basically, there’s still much to be done on interferon signaling, for example, the interaction of interferon-induced JAK/STAT signaling with other pathways in different cell types or in mature cancer cells/cancer stem cells. On one hand, efforts should be made to identify new interferon-induced genes and noncoding RNAs such as miRNAs and long non-coding RNA. On the other hand, continued studies are needed on the function of currently known ISGs and on finding the most clinically relevant genes among all ISGs for cancer therapy. As for clinical application of interferon, mechanisms behind side effects and cancer cell resistance are also the key issues. Due to the massive use of interferon in adjuvant therapy, the signaling that takes effect should draw more attention. Last but not least, novel recombinant interferons with different binding pattern towards classic receptors is expected, which could help in seeking for new receptors or distinguishing which current receptor plays a more important role in mediating anti-cancer activity of interferon. This manuscript is supported by Sichuan Science and Technology Project (2013ZZ0004), Shanghai Institutes for Biological Science, Chinese Academy of Sciences & Sichuan Huiyang Life Science and Technology Corp. Research Program (Y363S21763), the National Basic Research Program (973 Program) (Nos. 2011CB510104 and 2014CB964704). Tian P, Lin T, Hong J, Zhang Q, Wu H, Yu X, et al. 2′-5′P3A3 can enhance the activity of natural killer cells (in Chinese). Chinese Journal of Cell Biology. 1984; 6: 36-39.